LUMUHAND: 4 Legs Too Many.. I do not like eight-legged creatures, in fact, I hate them and they all deserve to die and unfortunately, much quicker than aerosol spider killer works. You see, I want them to die on impact and sadly, aerosol spider killer simply is not that efficient. As I'm screaming, I continue to press the trigger, the spray continues to jet out and the arachnid I'm trying to kill is still squirming in a sea of toxins. At this point, I'm a murderer. I'm okay with that, and I'm quite sure that it's far more traumatic for me than the spider that's taking too long to die. I know you're probably thinking, "why not just step on it? or squish it with paper?" There's several possible answers. 1. The damn thing is too huge. You know the ginormous ones that you're afraid you're going to feel when you step on them because they are so big. 2. I'm afraid it might escape my attack and crawl on/up my hand/leg/whatever body part it's near. 3. I simply don't want to get near it - I don't even want to pick up it's carcass. When it comes to venturing my hand into the unknown, I sometimes say a silent prayer, but most often I verbalize one (and 99.7% of the time they go unanswered) when I'm moving a box or going under the bed/near a crevice that I can't really see. It's like those little shits get a kick out of scaring the crap out of people me. I swear, I never move as fast as when I'm confronted by a spider and although terrified, I'm usually impressed by my quick reaction time. You know...some girls have on their "Soul Mate" list: Tall, Funny, Smart, Great Job...and these are all great, but ranking high on my list is "Spider Assassin." Kill those bastards with your bare hands, baby - that's hot. 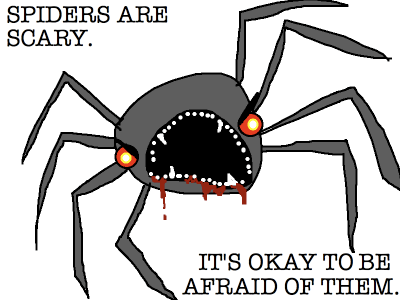 Frankly, spiders have four legs too many and even the smallest of ones are still too big and like the e-card floating around Pinterest (I may have modified it slightly) suggests, let us take a moment and thank Sweet Baby Jesus that spiders don't fly.